How we integrated a massive new feature into an already jam packed app. It’s never an easy task incorporating a massive new feature into an already fully functioning app, especially when the feature could be a standalone app itself. This was the exact problem we faced when we were deciding whether to add Call Recording to the roster of CallApp’s features. We chose to approach the Call Recorder as the MVP, which had its own set of unique challenges and would ultimately make for an exciting, interesting task. Plan the behavior and accessibility of all the call recording elements and how it would react with the pre-existing CallApp features. Our goal was to have an organic and seamless integration; which would then allow the user to enjoy the new feature, without losing the benefit of our familiar surroundings. The following is our journey of how we conquered Call Recording. 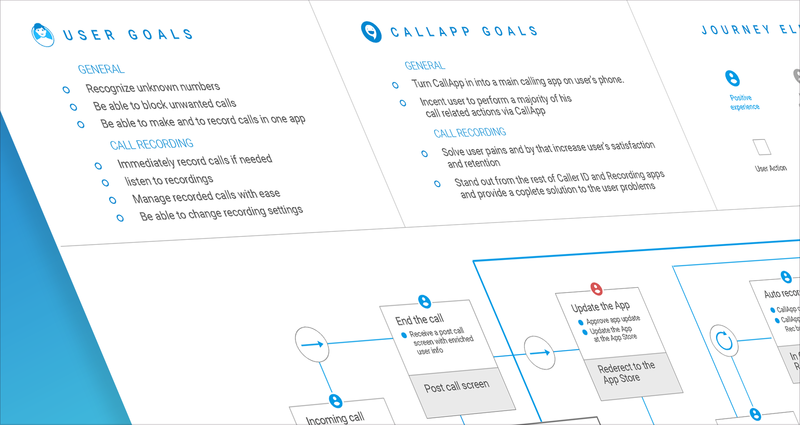 The first step was to justify adding a Call Recording feature to the roster of CallApp’s features. Any time we want to add a new feature we apply it to the overall Product strategy. To address pains users encounter in the general realm of Caller ID or CallApp itself. To advance and to further establish CallApp, as a one of a kind in the Caller ID market. We started by determining if this was a common user’s problem. 1. There is a vast number of apps offering single solutions in each of these categories. 2. The demand for these two services is growing. 3. No app was offering a complete solution containing both Call Recording and Caller ID. Further research showed that users were encountering many problems while using the Caller ID and Call Recording apps separately. Primarily of confusion, frustration and loss of precious time. Based on our research, we decided to fill this void and make CallApp the first of its kind by combining both Caller ID and Call Recording under one roof. The Call Recording feature, unlike our app’s other features, is a condensed version of a standalone application. Therefore, it was to be implemented incrementally. This helped us to assess the complexity of the whole package and to understand that we will have to aim to implement the feature in more than just one phase. We would need to concentrate our efforts on a lean and condensed version for the initial release. The key word here is simplicity. The first step is a user journey. The experiences (positive, negative & neutral) that the feature provides. At this point we realized having a pre-existing screenflow is a two-sided coin. Meaning that on one side, it’s easier when you have a pre-existing frame to build upon. On the other side, your user’s journey is also restricted by the need to navigate only through CallApp’s existing screens and features. In other words, our map was already set, but we needed to find a way to navigate new and existing users through it. Accordingly, two of the major junctions on this map are our ”Incoming Call” and “Post-Call” screens. This double screen feature served as central point in the Call Recording user journey. We had to acknowledge the fact that this is a critical point in user’s interaction with our app. A user, especially a new one, can feel a real discomfort meeting new and unfamiliar screens. Therefore, adding the Call Recording feature to this screen provides additional positive experience, which can help to overcome this obstacle. Hand sketches for me are an essential part to any design process. I have to contain a primal chaos of visual ideas and combine it with an established narrative of the user journey. It can be very rough or as with the case of Call Recording, very detailed sketches. 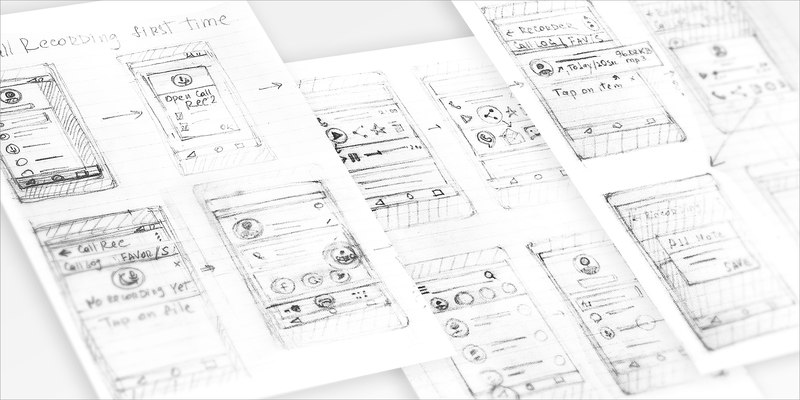 I hand sketched a whole feature based on the user journey; which allowed me to link wireframes directly to each respective sketch. It was an immensely important step in terms of saving time and money. This was needed essentially to understand what is possible and at what cost. 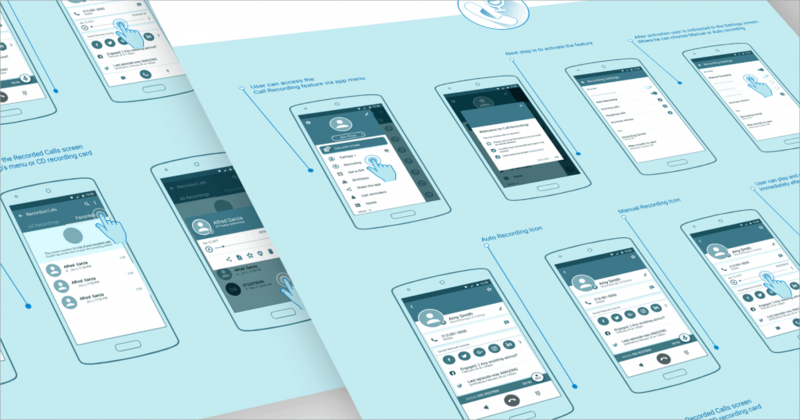 For example, an early discussion with the development team helped us to condense and redesign our Call Recorder’s setting screen to better fit into CallApp’s technological environment. Once again, these challenges are best to be illustrated in the “In — Call” / “Post — Call” screen sequence, a major junction in our user journey. These screens contain a large amount of user information in the form of a card-view, as well as actions users can take during and after the call. We decided to place the Call Recording button on the Incoming Call screen and subsequently a recording playback option on the Post Call and Contact Details screens. The main challenge here was the integration of a multitude of pre-existing actions. We also had to examine how we could educate users on the value of this new feature and which loops were needed to make sure that the user came back to the Call Recording feature. We had to create a direct route between CallApp’s main screens and the Call Recorder. We accomplished this through a Recording playback card menu and by using the Recording Calls screen, which is a screen the user can perform multiple actions on. Eventually, on the Recording Details dialog, we gave the user access to multiple recording formats. As well as the possibility to calibrate other recording settings. The whole progression of Product and Development departments were synchronized via Spec. The Spec is a living, almost sentient being. It grows and changes alongside the advancement of the design process. 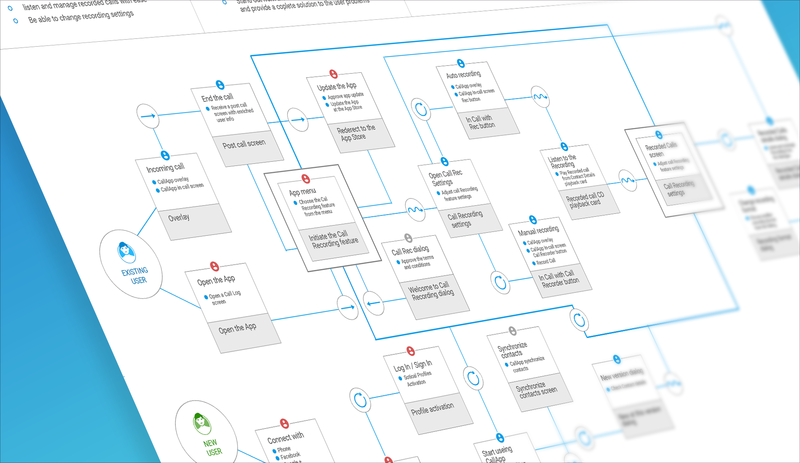 Wireframes are being replaced by designs, then further edited designs, and then by final designs. New in-depth descriptions of screens and functionality are added and replaced. All of this is done, while holding a constant conversation with the development team. Needless to say, this ever expanding and changing of Spec, is not only a essential tool for conveying UX narrative between the product and development teams, but it also has a direct impact on the design itself. We succeeded in becoming a one of a kind Caller ID application by seamlessly implementing a massive new feature into our app. 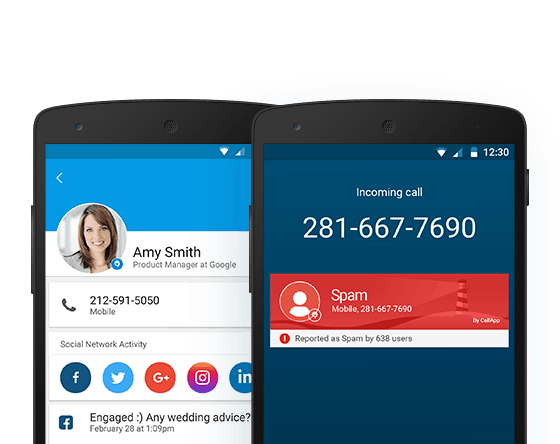 The final result is an organic and easy integration, which allows CallApp to stand out in the world of Caller ID apps. Giving our users an opportunity to record their calls directly from our app gives them a safe and powerful new tool. We keep moving forward every day. Each update we’re Improving our Call Recording feature alongside of our other features. We do this with the goal of increasing user engagement in our ever evolving and continuously growing app. Thank You for reading this article. You can find CallApp on the Google Play store.